Update, Feb 22, 2019: German Finance Minister Scholz blocks tax transparency. 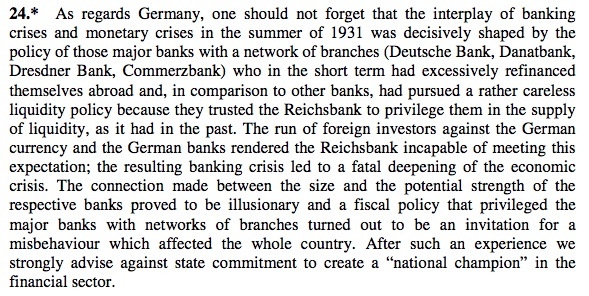 The following point is more disturbing: similar policies helped cause the financial crisis in Germany in 1931, which in turn contributed to the rise of fascism and eventually global warfare. All this is incredibly dangerous. Large financial institutions have always been influential in Germany, of course — witness, for example, Germany’s dangerous and austere response to the Greek crisis, caused in significant measure by reckless lending to Greek borrowers by German banks. But it’s probably fair to say that German carmakers have had more political clout. This now appears to be changing. And let’s not forget that Germany is already a major tax haven. Overall, Germany is actively courting the finance curse, and Scholz appears hell-bent on accelerating this process. When a financial sector grows beyond its useful size and role, it starts to inflict damage on the country that hosts it. Jobs and tax revenues generated in the financial sector are offset by much larger damage in other parts of the economy and society, in a complex range of areas: too-big-to-fail banks, a brain drain out of other productive sectors, the financial equivalent of the Dutch Disease (where local price levels rise, crowding out other sectors), the capture of the establishment by financial interests, the transformation of finance away from its useful wealth-creating roles into more profitable wealth-extracting roles, rising inequality, and much, much more. To illustrate the potential pitfalls, compare productivity in the two countries to see how poorly finance-dependent Britain does compared to car-crazy Germany. Here’s the latest OECD data. This woeful British performance has many causes, but the finance curse analysis may well provide the best general framework for understanding what has gone wrong. Yet this isn’t all that’s dangerous about Scholz. Back in July we wrote a piece entitled Why is Germany siding with the tax havens against corporate transparency? in which we argued that Scholz was sabotaging a key European transparency measure through procedural measures, apparently designed to allow multinationals and tax havens veto any measures. So large global technology monopolies and their aggressive efforts to squash competition are just fine, Mr. Scholz appears to be saying. The SPD was the political party that had campaigned hard for an FTT – but once in office it simply threw the measure out of the window. seen as hugely inhibiting of efficient business by perfectly respectable companies that have never defrauded anyone”. “Seen as” – but by who? By Blair’s good friends in the City of London, of course. Now this same reckless class of global finance bosses who captured the British establishment seems to be getting a good hearing in Berlin. Are the latest unpleasant events in the German town of Chemnitz really such a surprise?